Expensive, but Stan's stuff just works. Been using Stan's since 2004 and see no need to change. I haven't had a puncture so far, at least, not one that I have noticed. Sealed my tubeless setup well, can't speak for puncture protection yet. First time using this variation of the sealant. Interestingly as I inflated the tyre it immediately sealed 3 punctures and maintained them on a 40k off road ride too. Given 1 of the punctures was right next to a grip block I was pretty impressed - other sealants have failed in such positions. Best price I could find, and at only slightly more than the normal stuff, I figured I might as well give it a try. Be aware that you can't inject it into the tyre in the normal way, as it would clog your valve because it seals so quick - my initial concern about it clogging the valve if left valve-side down proved unfounded, as it still allows the tyre to inflate and deflate as normal after several weeks. Improved puncture sealing also adds greats confidence to my riding. Better choice than standard sealant if you run plus tyres over rocky terrain as you are gonna need all the gloop you can get to plug tears. This sealant is a bit thicker/ more granular than standard Stans so needs to be poured directly into the tyre rather than using the injector through the valve. No punctures yet! I got this because I had two holes in the previous two weeks that Stans didn't seal & needed to put a tube in on the trail.....messy! Hoping this works better. It's expensive though. 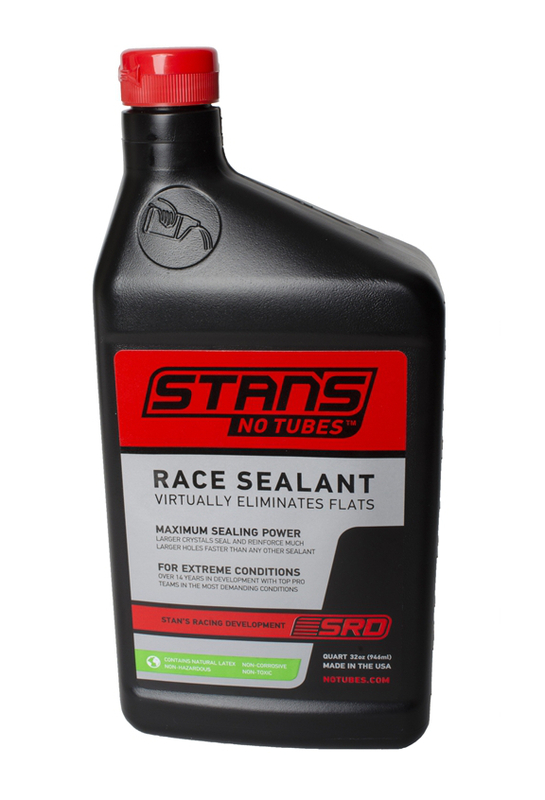 The best tubeless sealant out there! OK it costs more but it definitely works. Easy to install, but no flat tyres yet so hard to say if it works better than standard sealant!